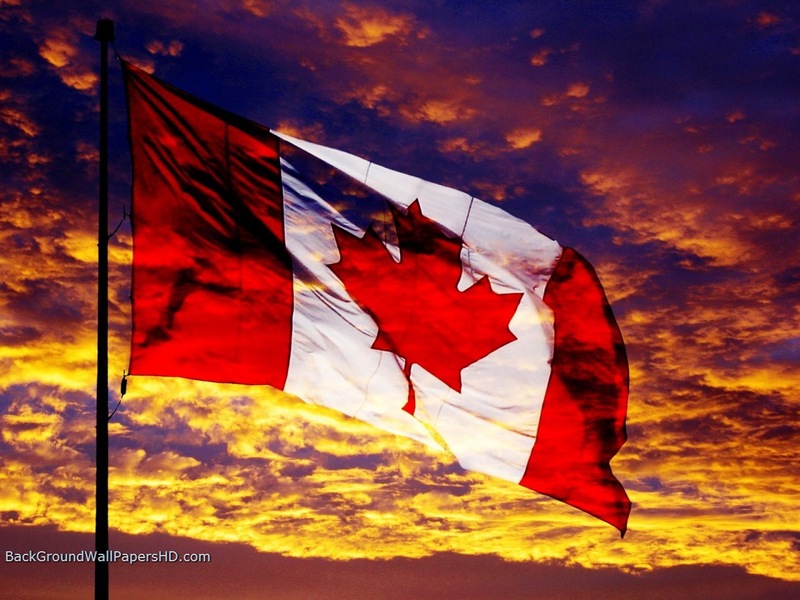 Canada is more than a location, a huge land mass, a country, a set of borders, a group of people with a common language, government and currency. Canada is an idea: the founding of a collection of souls from around the world into one fold, with a common set of values, a common bond of pride in who we are, what we have done and where we are going. 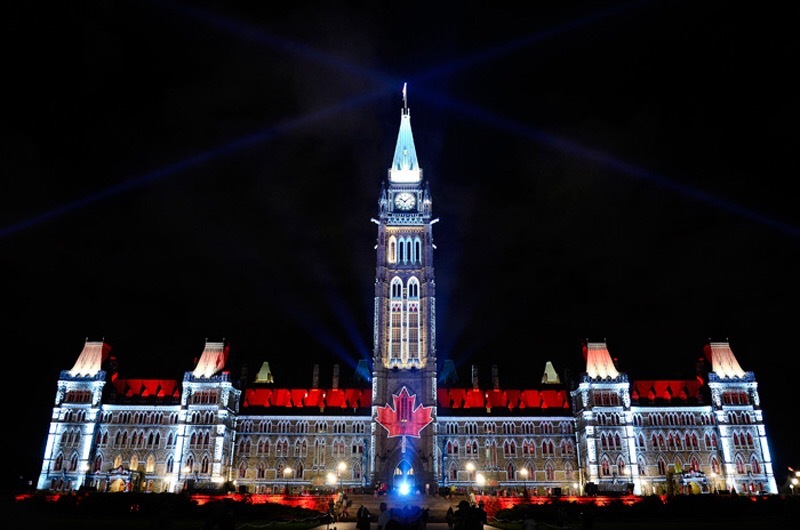 As Canadians from sea to sea to shining sea gather together today with their friends, families or entire communities to celebrate the 149th Birthday of the Dominion of Canada – the land we love so much – a few things popped in and out of my head as I thought about our homeland. I’m happy to report that this morning, as I did last Canada Day morning 2015, and as has been the case every other morning of our lives in Canada thus far…. we all woke up free. Having a hard time grasping how precious that is, or what that even really means? I completely understand and could relate – until, that is, I got on a jetliner and headed to Australia, France, Spain, North Africa and all over the United States. And suddenly, it all became incredibly obvious how blessed we are as Canadians to live in a mosaic of cultures that still works. It’s true that on this Canada Day perhaps more than any other in modern history, we are threatened by groups that want to wipe us off the planet, and the occasional drooling Neanderthal from this illiterate lot occasionally sneaks into our country to try to do so. ISIS has even threatened to kill Canadians in their own bedrooms in the past. But we are not afraid. We have heard this all before. We heard it in the 1930s and 1940, generally followed by shrieking “Sieg Heils”. Adolf Hitler had 20 million soldiers in his Armed Forces – our entire population wasn’t that large. Regardless, our teenage boys and young adult men went over there by the hundreds of thousands – in fact, nearly 1 million Canadians total – and we barrel-rolled over his goose-stepping goons in France after storming the beaches of Normandy. Then we liberated the Netherlands before pushing the Nazi beasts all the way back into Germany, where their ultimate defeat awaited. Look, some Canadians have lived through a record -81C temperature, and we all suffered under Free Trade, a 69 cent dollar, 20% interest rates, a 13.1% national unemployment rate and the GST. Pierre Trudeau (shivers)… and now his idiotic offspring. There’s really nothing out there that’s bigger than we can handle. On this Canada Day, as with the 148 before it, Canadians will have a day of lawn chairs, hot dogs, and fireworks – and have you noticed how sunny Canada Days tend to be? But the day really begins the moment we catch a first glimpse of our iconic flag – snow white and crimson red – painted on a cheek, draped as a cape, emblazoned on a T-shirt, or hanging from a balcony. As far as the experts in marketing will tell you, it’s one of the most brilliant, simplistically designed brands in the world – and the whole global village knows who it belongs to the moment they see it. Like the Red Cross flag it closely resembles, it speaks safety and healing and security to the masses of wounded, terrified, displaced peoples everywhere. Canadians have a reputation for quiet patriotism – until the flag comes out. Then it’s all bets off how emotional we are going to get. We live in a peaceful land with a federal government which has never been overthrown or even temporarily supplanted in an internal coup. In fact, the very idea of Canadian democracy itself has never been truly threatened – not ever. In the 149 years of our national story, no foreign power has ever overrun our borders (except maybe Wal-Mart) – not once, not even for 5 minutes. 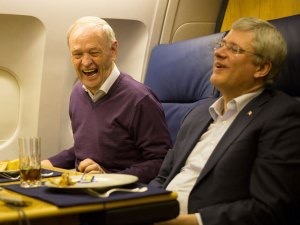 Former Prime Ministers Jean Chretien (Liberal) and Stephen Harper (Conservative), political foes, enjoy a laugh together as they flew 18 hours to Nelson Mandela’s funeral last year. They were joined by Canada’s first female Prime Minister, Kim Campbell (Conservative) and Brian Mulroney (Conservative) – the four lead Canada for nearly 30 years total. And you can be absolutely certain of one thing – in Canada, the wider the pendulum swings back and forth, the quieter the streets will be the next morning. We have never protested the results of elections being won by illegal means or so ridiculously close to call we waited days for the results – because it’s never happened. If Canadians are happy with a government or have no reason to be mad, they could stay elected forever. But if we are furious with them, we wipe them off the face of the earth or whip them back to the doghouse and give the other side fair chance to prove themselves. There are no dynasties or guys that we just can’t get rid of. We took Brian Mulroney’s massive majority government down to two seats in the next election. We’d never wipe out a ruling party though because we know eventually they’ll be needed again. Our politics are just that logical. There have been no riots on election days, no rubber bullets, no tear gas. If our guy loses, we get up and put our pants on the next morning one leg at a time as we always have, perhaps grumble at the water cooler when we get to the office – then graciously accept the fact we’re gonna be slightly irritated by the new Prime Minister for his entire term – unless of course, he surprises us by doing something out if the ordinary that we can actually relate to, and he becomes “our man” (perhaps for that hour) as well. Since the founding of Canada in 1867, we have had 149 consecutive years of total peace within our borders – there has never been a war or rumour of war. I am not sure that any other country on earth can make such a claim. Our military is small but mighty. We dared to stand tall even the United States of America in the War of 1812, crossing the border and setting many public buildings on fire including the White House (which we burned to the ground – sorry about that! ), and then successfully returning all our troops home. In World War I, just 50 years along as a nation, we conquered Vimy Ridge when no one else could. We mobilized an army that was nearly 8% of our entire country’s population. We were often used as cannon fodder, and far too many of our boys died in places like Passchendaele, Ypres, and the Somme, that we could barely spell or pronounce. But we fought for King and in so doing, we became a country. In World War II, our farm boys from Saskatchewan and city slickers from Vancouver and Toronto all stormed the same Juno Beach together, and were the only country on D-Day – June 6, 1944 – to successfully land our troops and push into Nazi territory, completing all of our ordered objectives. Then we waited for our British and American allies to catch up. We continued the push across Europe and almost single-handedly liberated the Netherlands from Nazi tyranny. It should be again stated that Hitler’s armies numbered nearly 20 million – larger than our entire Canadian population. But we were not going to be defeated. Oh, and by the way, the Netherlands still celebrates a special “Canada Day” ever year, as their eternal thanks for their liberation. It makes me emotional even to think about it now. We served in many other conflicts, liberating captive populations and policing others in Korea, Kosovo, and Kuwait. We became known as the peacekeepers – we were the ones that no one wanted to mess with privately, but publically, oh they may have made fun of our older weapons and tanks and planes. But we have a secret that makes all that new-fangled, high-tech equipment today mostly irrelevant anyway. There have been very few moments in history when any other nation on earth has ever wanted to actually harm us. But shhhhhhh, keep that under wraps. Oh yes, the world laughs at us for being so polite. We apologize…sometimes several times… when someone else walks into us, and I’m sorry I have to even admit that to you. We’re so mild mannered and boring up here, there were actually some Americans over the decades who believed we were closed on the weekends. The entire country. Terrorists don’t generally want to blow us up. They barely remember we’re here. No one goes on television or radio or stands in large rallies and screams “Death to Canada” or brags about the missiles they can launch now upon Toronto or Montreal. It just simply doesn’t happen. EVER. And you know why? Because they love us. Deep down, they all really do love us. The 2015 report from the Reputation Institute ranked Canada as the #1 most reputable country in the world, based on a variety of environmental, political, and economic factors. Oh, and we have been one of the top two countries EVERY year for the last 10 years in a row. Our former Prime Minister, the Rt. Hon. 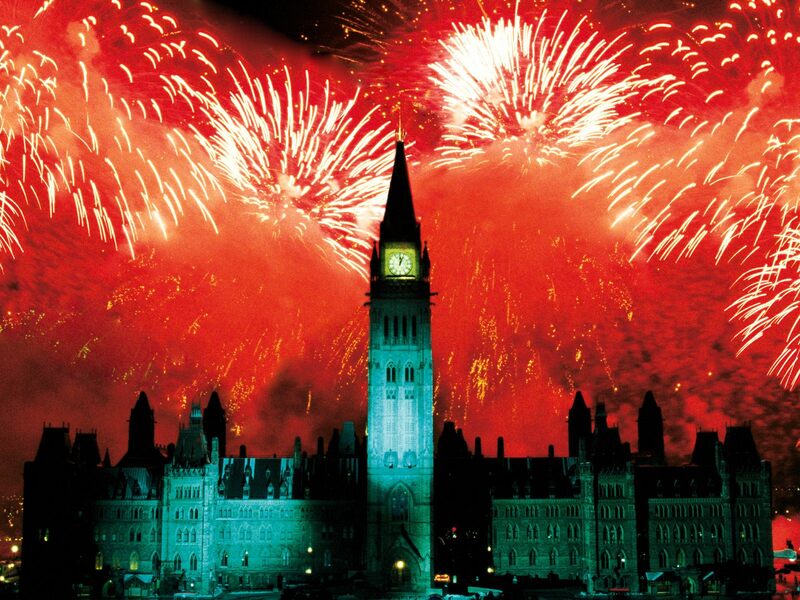 Stephen Harper, said it best on Canada Day 2013, when he described Canadians as..
May God keep our land…glorious and free! Next PostAmerica’s Glory Days: Distant Memories?